Aaron McCann and Dominic Pearce's mockumentary TOP KNOT DETECTIVE is one of the coolest films of the year. A dead on perfect send up of the type of crazy shows that filter out of Japan that leave audiences scratching their heads and giddy with delight. The premise of the film is that in the 1990's there was a Japanese TV show called TOP KNOT DETECTIVE that lasted one season. The show started out as a more or less straightforward samurai/detective show made by a singer who didn't know how to make films and it morphed into weirdness not long before a series of odd and tragic events stopped production. The show then disappeared and only exists in VHS copies that were made when the show aired in Australia. Owing to the weirdness of some TV shows from Japan it is entirely possible that if you didn't know that the film was a joke that you would think it was real. Nothing we see in the clips from the show from dancing girls, a Kamen Rider like character, splurting blood or just the general arch acting would make you think it wasn't real. Everything looks right even the VHS clips (which apparently come from ful episodes that were shot by the directors in Japan). Everything come together and as a result the film is screamingly funny. This is the sort of film where the more you know of what is being sent up the funnier it is. In all seriousness this film spoofs or kids pretty much everything you can think of relating to Japanese culture and ow it's perceived by non-Japanese which results in a steady stream of laughs. Most amazingly the film is so well done that the film can be seen as not really being funny simply because it gets everything so right that you're tempted to take it all straight. I loved this film a great deal. I loved it so much I wish I had seen the film at something like the New York Asian Film Festival where the place would have been full of people on the right wavelength to get the film. If you are a fan of Japanese genre films or TV the film is a must...and its a must even if you just like well done comedies. 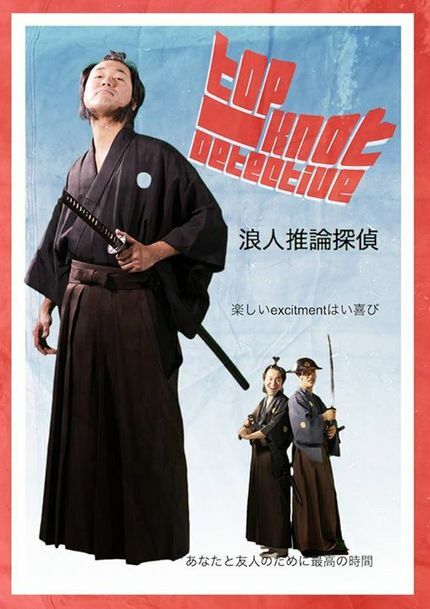 Destined for cult status TOP KNOT DETECTIVE is highly recommended.